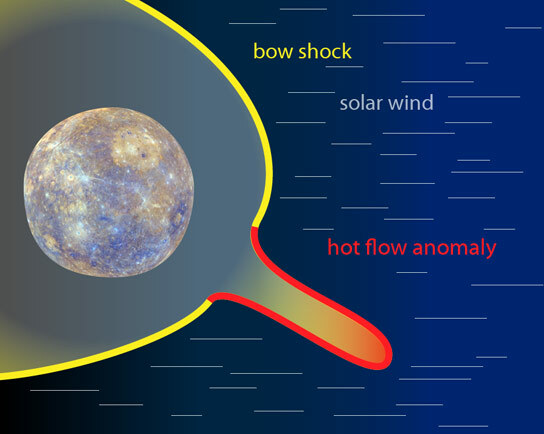 Using data from NASA’s MESSENGER mission, scientists have identified hot flow anomalies in Mercury’s bow shock over a course of two planetary years. The solar wind of particles streaming off the sun helps drive flows and swirls in space as complicated as any terrestrial weather pattern. Scientists have now spotted at planet Mercury, for the first time, a classic space weather event called a hot flow anomaly, or HFA, which has previously been spotted at Earth, Venus, Saturn and Mars. The results were published in the Journal of Geophysical Research: Space Physics. To identify the presence of HFAs at Mercury, the team used observations from NASA’s Messenger (short for Mercury Surface, Space Environment, Geochemistry, and Ranging) to detect the presence of two HFA signatures. The first measurement was of magnetic fields that can be used to detect giant electric current sheets that lead to HFAs. The second was of the heating of the charged particles. The scientists then analyzed this information to quantify what kind of turbulence exists in the region, which provided the final smoking gun of an HFA. Not only is this the first sighting of HFAs at Mercury, but the observations help round out a picture of this type of space weather in general. HFAs come in a variety of scale sizes – from around 600 miles across at Venus to closer to 60,000 miles across at Saturn. This study suggests that the most important factor for determining HFA size is the geometry and size of the planet’s bow shock. Be the first to comment on "NASA’s Messenger Discovers Hot Flow Anomalies at Mercury"